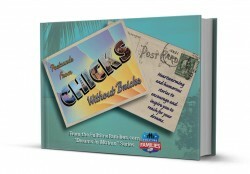 Chicks without Bricks is the perfect blend of funny,uplifting, travel stories that will inspire you to pursue your dreams! Featuring works from: Margie Lundy, Nancy Sathre-Vogel, Dana Ticknor, Lainie Liberti, Laurie Sontag, Sarah Parent, Kimberly Travaglino, Jenn Nims, Jennifer Miller, Mother/Daughter Duo Sheri and Hanna Smith, and Mary Beth Goff. “Need a glimpse into what RV-living is really like for mothers? This is it.